When to Prune Gardenia Plants? With origins in the subtropical parts of eastern Asia, the common gardenia or cape jessamine (Gardenia jasminoides) grows outdoors where winters are mild. Typically growing 5 to 10 feet tall, gardeners may need to trim the plants to limit size or improve their overall habit. The ideal time to prune gardenias is immediately after the primary flowering ends in spring or early summer. Sporadic flowers may still appear later in summer or fall. Dead branches may be pruned away any time of year on gardenia plants. When it comes to annual pruning of living tissues, schedule it for immediately after the main flowering display winds down. Depending on climate, pruning time falls from late spring to midsummer. Gardenias produce their flower buds on year-old wood -- branch tips that grew and matured last fall. Pruning after flowering ends encourages new growth that has time to mature by fall, and thereby yield flowers the following season. Avoid pruning in fall, since regrowth may not acclimate in time to endure initial frosts and freezes without damage. Gardeners successfully grow gardenias outdoors in U.S. Department of Agriculture plant hardiness zones 6b through 11, depending on cultivar. Gardenias do not usually survive winter temperatures that go below 10 degrees Fahrenheit. In subtropical regions, such as in South Florida, late winter's warmth coaxes flowering to begin as early as March. In parts of eastern Texas and in South Carolina, in USDA zone 8, flowering occurs in May. Flowers appear in June slightly farther north or at higher elevations. Therefore, time annual pruning tasks after the flowering in your region. Floridians prune in early June, while North Carolinians or western Oregonians prune in early July, for example. Several reasons warrant pruning or light trimming of gardenia shrubs. Awkwardly long or leggy branches can develop on plants; reducing the branch length creates a uniform silhouette. Trimming branches also increases bushiness, as multiple stems arise from just under the pruning cut. 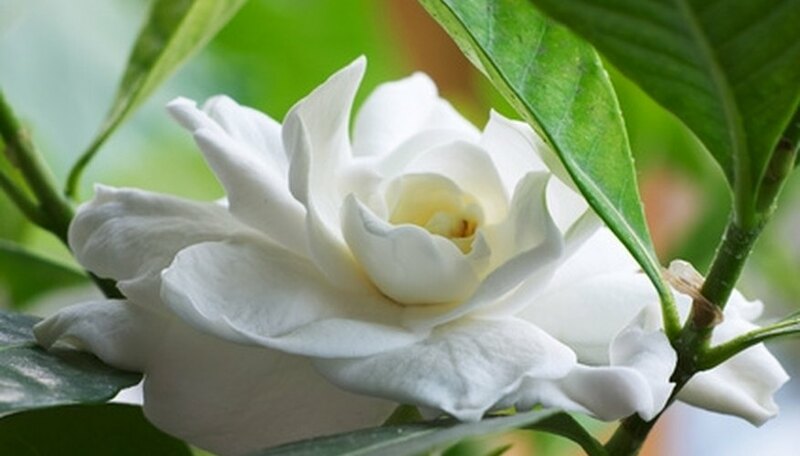 Tom MacCubbin, the plant doctor for the Orlando Sentinel, writes that gardenias tolerate severe pruning and rejuvenate when cut back at lower branch junctions or to the main trunk. If any branches or leaves are killed by winter cold, hold off pruning until spring when frosts no longer threaten. New growth occurs to fill in the void over summer. Gardenias need bright light to become nicely shaped plants. In hot summer regions, some shade in the afternoon is beneficial; otherwise, partial sun is a good light exposure for gardenias. To prevent leaf yellowing, called chlorosis, maintain an acidic, organic-rich soil with pH between 5 and 6. Keep the soil evenly moist, neither soggy nor bone dry. Kirsten Albrecht Llamas, author of "Tropical Flowering Plants" advises to avoid any root disturbance in spring when flower buds appear, as root damage can cause buds to drop off.